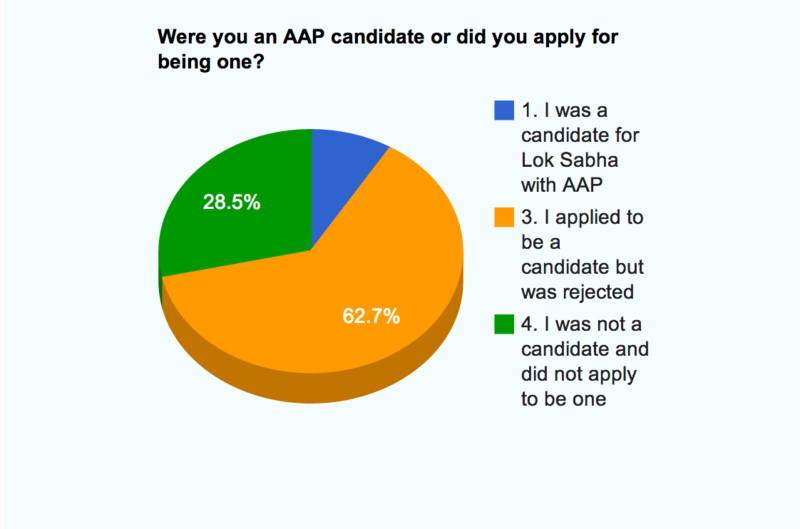 Sankrant.org surveyed AAP core volunteers, included people that were AAP candidates for the Lok Sabha elections. The results showed disappointment at the election results and uncertainty about the party’s future direction. However, nearly half of those surveyed still said they trusted AAP’s leadership despite the problems. Nearly 9% of the respondents were AAP Lok Sabha candidates, while a whopping 62.7% had applied to be candidates to the Lok Sabha. The Lok Sabha candidate pool turned into an effective volunteer and member recruitment system for AAP. 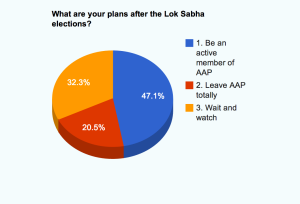 77% of the respondents agreed that they worked very hard for the AAP Lok Sabha campaign. However, most were disappointed with the result with only 6% strongly agreeing that AAP did well in the elections and another 13% agreeing. The strongest reaction was to AAP’s strategy to contest 400+ Lok Sabha seats with 2/3rd of the respondents disagreeing with the decision. Nevertheless, trust in AAP’s leadership was evenly divided with exactly 50% feeling they could trust the leadership while another 50% disagreed with that. Though AAP leadership was seen to be trustworthy by half, a whopping 69% disagreed that AAP was on the right track. So now what? 47.1% of the respondents wanted to continue being active in AAP while another 20.5% were quite sure they wanted nothing to with it anymore. The remaining 32.3% were in wait and watch mode, suggesting that the AAP leadership has its work cut out for it in keeping its flock together. Though only 47.1% of the respondents were certain to stick with AAP, a slightly larger number, 53.2% didn’t want to jump into anything else as of yet. 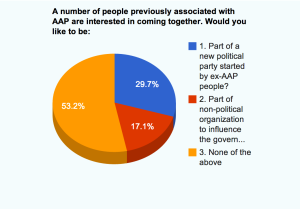 Nearly a third (29.7%) of the respondents want to be part of a new political party started by ex-AAP people, showing that people involved with AAP are keen to stay in politics, whether or not as part of AAP. 17.1% felt that they would rather be part of a non-political issue based organization to influence the government. Part II will share specific comments made by people in the free response section of the survey. 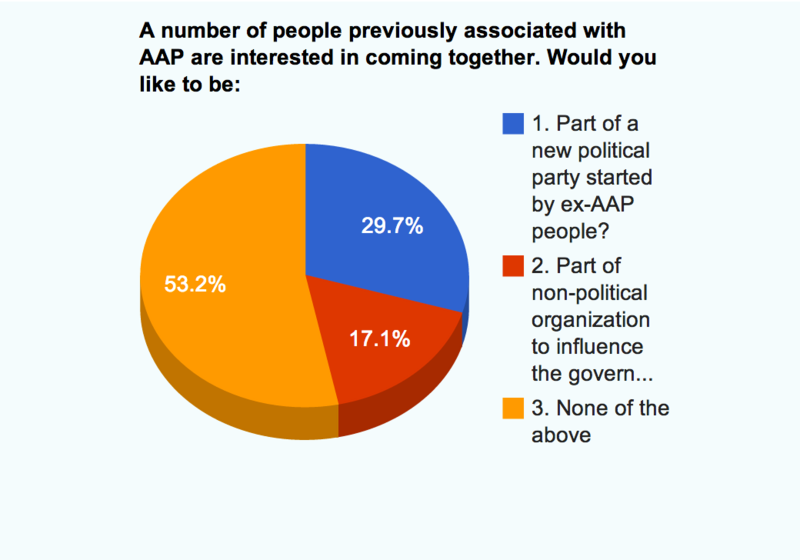 This survey was done on the behalf of AAP founder Ashwini Upadhyay who provided the list for the survey. Personally, I do not agree to the 29.7% forming and ex AAP political party. Why do you need to compete with the original AAP? Rather get into the original AAP and improve it. If the intention and goal is same, then why one more political party? The 17.1% working as a NGO, is also not viable to bring an effective Jan Lok Pal Bill. When Arvind Kejriwal and the top leader have admiitted their mistakes, and are trying to solve it, why this mistrust? Those who are disappointed with the LS Poll results, were over ambitious. The 400+seat was mistake and many more mistakes were done, but this is AAP's first LS elections and they failed because of their immaturity. But winning 4 seats was not bad for a one year old party. See the records of other parties in their debut election. So, guys have faith in AAP and give them some more time please. Agreed…… As per my observation , AAP is progressing. Innovative party.